It’s hot. Not just any hot, but Sicilian hot. Which is why we are out at 8.00 am, before the heat forces us to stay locked indoors until sunset. It’s time to pick capers. Caper plants thrive in stone walls and rocky crevices, and disdain rich earth – in fact the few that I have managed to grow in a pot are decidely puny, while a cliff of limestone sends the capers into a fit of ecstatic growth. And then there are the flowers. Exquisitely delicate, they last no more than 24 hours, leaving behind a stem with a tiny seed pod that will grow into a caper fruit, called cucunci in Sicily. But I’ve gotten ahead of myself. 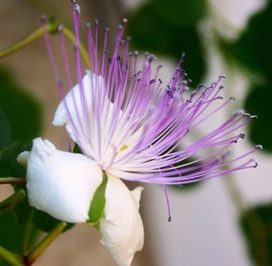 The capers are the buds of the flowers before they open. In Sicily, they are traditionally preserved in salt, which is easy to do at home. Start by picking as many as you want, choosing the tight healthy buds – leave the large ones that are ready to open into flower so at least someone else may admire it in the next 24 hours. 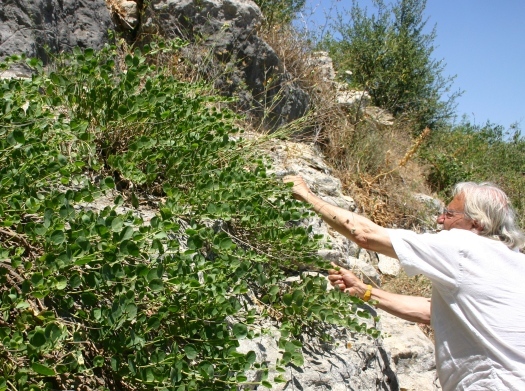 We like to combine a lovely walk with caper picking in the canyon of Misericordia near Ragusa, where sprawling caper plants drape the limestone cliffs, and we are far from any kind of pollution. A 15-minute downhill walk brings us to a narrow trail that hugs the cliffside, and capers grow in profusion As birds sing we rustle through the caper leaves, the scent of wild mint in the air. The tiny buds break off easily in our hands, and we quickly filling a small bag. Before trekking back to the car, we stop to cool our feet in a clear stream, and Emanuele flicks tadpoles with his toes. The sun is hot on our backs as we continue our walk which has clearly become a trudge, and we realize that we should have started at dawn. At least we had the good sense to park in the shade. A short drive with the A/C blasting and we are back in the kitchen with our caper stash. Go through the capers carefully, picking off any extra-long stems and stray ants (particularly important if you are vegetarian). Rinse them in a colander, and pat dry on a dish towel. Place the capers in a jar, layering them with fine sea salt. Cover the jar with its lid and shake it to make sure the salt is well distributed. Remove the lid and cover the jar with a single layer of a paper napkin or tight netting, and close with an elastic band. Leave it in a place where it will get some airflow, but not in direct sunlight – a breezy countertop is good. Every day, drain off any liquid that forms, and add another spoonful of salt. After about a week, or when the capers stop giving off liquid, transfer to a clean jar/storage container and cover with a lid. The capers can be kept on a shelf for up to one year. I was lucky enough to be in Pollara for the Caper Festival recently but to be able to go for a walk and return with capers to cure yourself would be a real treat. Oh to live in Sicily! @ Jenny Sounds like you had fun at the caper festival. Capers grow in other places in Italy – I have seen them growing out of stone walls in Tuscany – but they seem to be more prolific in Sicily. Wonderful website – great post! Thanks! Do capers grow where you live? 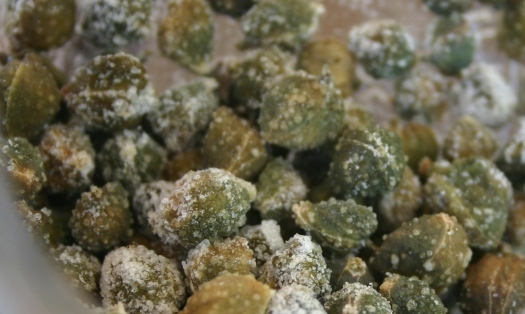 Nice post, I see capers all the time in Sicily, and would see them in salt, but never realized that it helps preserve them! Nice blog, I found you on twitter. I’ll be surfing it some more. When the process of preserving is finished after no.9 can vinegar or brine be added or not? Hi Marlene – The capers hould be left as they are,, and rinsed of excess slat when used in cooking. Using brine is a totally separate process for preserving capers, and I find preserving in salt is easier to do. I bought some capers, that had been stringed, in Turkey. I don’t want to brine them. They are hard and dried. In your photo they are pretty and green. Can I still use your salt method? It sounds like your capers have already been preserved if they are hard and dry (which doesn’t actually sound that good…) Maybe you should rinse them and see how they taste. Hi I picked some capers yesterday and covered them in sea salt. this morning they are covered in maggots!! yuck!! they were in a large bowl – not covered overnight. do you think the worms came from inside the capers or do you think a fly got into the bowl? have you ever experienced this?? Yuck is right! Fortunately, I have never experienced this. If they were covere din maggots after such a short time it makes me think they came from your capers. Last year I picked some caper bud and soaked them for three years changing their water almost 3-4 times a day. After that they were so tasteless, when they were fresh they tasted like watercress, garden cress, broccoli and maybe what people refer to as mustard-like taste. I thought maybe when I pickle them that great taste of pickled capers will surface. But it did not. Was it because I soaked them for so long and changed their water so often? The ones I picked do not taste bitter or bad. They can be eaten raw as free broccoli or watercress so I don’t see any point in soaking them. I asked one trader and she told me to get the bitterness they dry them for one day and then pickle them in brine. Are you sure your capers still were great after one week of soaking in water daily changing the water? The capers are salted, not soaked in water! 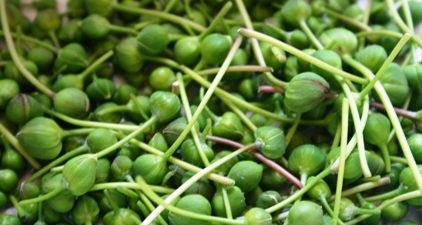 Like olives picked directly from the tree, are capers also inedible (too bitter, or worse, toxic) if consumed directly from the bush, without the process of preserving them? Anita if I buy a 2lb bucket of salted capers can I can them in smaller jars or freeze them in smaller quantities. I love capers in a lot of dishes and go through a lot but the price is not helping my addiction!! Lol I found a 2lb bucket online of salted capers for $16 and that is definitely worth it but trying to be frugal and not have that big container opened all the time!